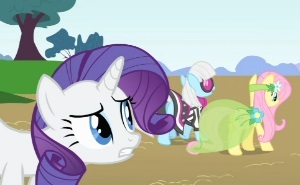 Episode 20: "Green Isn't Your Color"
Act 1: Spike confides to Twilight his crush on Rarity. Photo Finish takes pictures of Fluttershy at the boutique and in the park and selects her as his new model instead of partnering with Rarity on her new designs. Act 2: Rarity insists Fluttershy accept the modeling offer but pouts while alone. Fluttershy's cringing fear of public attention elevates her to fame and she is mobbed by the masses. 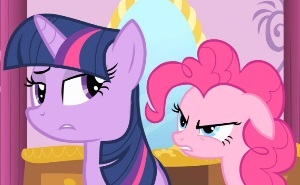 Both ponies tell Twilight of their dissatisfaction but swear her to secrecy. Act 3: Twilight manages to keep her secrets but plots to rescue Fluttershy from fame. She uses magic to trip Fluttershy up at a fashion show, but Rarity defends her and wins back the crowd. Backstage, all secrets are revealed as the ponies learn the importance of communication. Character: Introduces Photo Finish, who's fun in small doses as a comedic character and a parody of the fashion industry if not the art scene as a whole. This is a textbook example of a character-driven plot: Of course Rarity would insist on Fluttershy taking the opportunity, and of course she would be jealous but nevertheless stand up for her friend. Of course Fluttershy would hate the job but refuse to let Rarity down. Of course Twilight would offer herself as a confidant and be desperate to intervene. Work in the secret-keeping aspect and a moral on communication, add jokes to taste, and out pops a delightful and brilliant episode. If you watch the season in chronological order, this is the first real positive attention Rarity gets, and it shows her to be a morally conflicted character, just as people are in real life. She is generous, but usually in giving what she herself would like to have rather than what the other pony might actually want. This leaves her jealous despite herself since she wishes she had it too. (Consider it an overly literal approach to the Golden Rule.) She's not really asking what Fluttershy would want, instead assuming she must be happy. Wait, I said positive attention, didn't I? The fact is, all this is because of Rarity's generosity and dedication to seeing things through, to the point of joining her friend in public humiliation even though it almost ensured Fluttershy's continued success that was such a thorn in her side. Fluttershy comes off very well here. It's no revelation that she's shy. But that makes it all the more impressive that she's doing this for Rarity, and the one time we think she's about to tell Photo Finish she's ready to quit, she's only pointing out that she's running late for her spa visit with Rarity. On that note, the two having weekly spa visits is another nice reminder that the non-Twilight five are friends with one another and not just with Twilight. We'll take all we can get of this, especially since at this point in the series Twilight is still writing all the letters. Pinkie gets a new facet to her character with the Pinkie promise, and judging by the fanfic entries I've read, it is perhaps creative bronies' favorite trait for Pinkie. I'm constantly seeing it worked into non-Pinkie stories, along with Pinkie's inexplicable presence and "FOREVER" warnings. Here her valuing of every friendship and her command of cartoon physics are put to constructive use. What happens when you break a Pinkie promise? We find out in a future episode, and it is glorious. Lesson: A twofold lesson on when to keep secrets and when not to. Children and adults alike have the silliest habit of saying, "Don't tell so-and-so I said this" when they really should be talking to so-and-so. It invariably leaves the confidant feeling burdened and the so-and-so feeling insulted when the truth comes out. The episode thus illustrates a common real-life scenario that's easily avoided by applying the show's lesson. And the presentation is primarily positive. We spend more time watching Fluttershy struggle with stardom than with Rarity pouting and feeling jealous, and their concern for each other's feelings keeps them from open hostility. Another important lesson well-taught. If you look carefully, Photo Finish has Twilight Sparkle's cutie mark. This is an animation error (it wasn't meant to be visible), but in-universe it suggests that a mark may bear different interpretations, in this case probably the flash of a camera. Connections: The "Rarity arc" redeem her character from the less flattering appearances she's made earlier in the first season. Photo Finish is in the background in Sweet and Elite and her alt-dimension counterpart makes several appearances in Equestria Girls. Pinkie promises are still in play, though not as often on the show as in fan works. 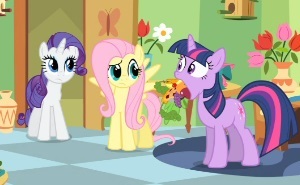 About a dozen of the ponies who mob Fluttershy when she loses her hat are members of the Apple family, several of whom haven't been seen since the premiere. Resonance: Pinkie steals the show here with everything promise-related. Otherwise, the laughs come from the over-the-top character of Photo Finish and the bewildering tastes of the high-fashion crowd. Fluttershy's little scream and a few of Rarity's comments elicit chuckles as well, as do Twilight's efforts to keep her mouth shut backstage. There's an overall feel of heartwarming over the fact that Rarity really cares about Fluttershy and struggles to keep down her jealousy, ultimately standing up for her. Rarity's squeal of excitement when she first thinks she's been chosen is adorable. Other Impressions and Final Assessment: Rarity is unknown in her profession here, so chronologically this is the first episode of the "Rarity Arc," followed by Suited for Success and then Stare Master and A Dog and Pony Show. (The last two are interchangeable.) Enjoy the Rarity episodes while you can; they're few and far between in the second season and absent in the third. She comes back with a vengeance in season four. While some of the designs in this episode are necessarily outlandish, they're all very well done. 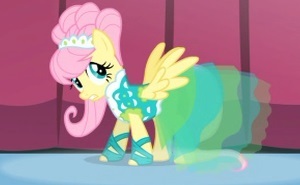 One example of attention to detail is at the end of the first act, with the diaphanous material on Fluttershy's dress, by which I mean if you look really closely (not that I was trying), you can kinda see through it (not that I wanted to). Raves all around; see above. And as usual, there are little subtleties that add layers to the story, particularly as a parody of the fashion industry. For example, when Fluttershy is first chased by the paparazzi, the ponies from Photo Finish's crew can be seen behind the photographers. So just how much of Fluttershy's popularity is the designer's own artifice? My only reservation here is that having another fashion-related episode so quickly after Suited for Success. Viewers just starting with or checking out the series might not be able to see past the girly subject matter. Swarm of the Century, Sonic Rainboom, and Applebuck Season would make better starter episodes. But all in all, this is one of the best entries of the first season.